Punjab State e-Governance Society, O/o Directorate of Governance Reforms, Punjab has given a notification of 09 Web Developers, Dot Net Developers and Finance Manager Vacancies on the contract basis for a period of 02 years. The interested candidates can apply online for Punjab State E-Governance Society Recruitment 2018 on or before 10 June 2018. DGR Punjab Recruitment 2018-19 notification is out. As per the Notification, there are 09 Web Developers, Dot Net Developers and Finance Manager Vacancies. The educational qualification is Engineering and CA degree. The maximum age limit is 38 years. If you are looking for Jobs in DGR Punjab then this article is going to be very helpful for you. Web Developers B.E. in IT or Computer Science/B. Tech in IT or Computer Science/M.Sc in IT or Computer Science/MCA from the recognized board with at least 60% marks in aggregate and should have 04 years of experience in the relevant field. Finance Manager CA with expertise in the tally, Income Tax Matters and GST is essential. The candidate should have minimum 08-years of experience with at least 03-years of experience in handling of finance and accounts. Web Developers: Rs. 40000/- Per Month. Dot Net Developers: Rs. 40000/- Per Month. Finance Manager: 60000/- Per Month. The maximum age limit is 38 years as on 01.12.2017. The eligible candidates shall be called to appear for the written test and the qualifying candidates shall be allowed to undergo further evaluation process and final interview. You are required to deposit Rs. 500/- through NEFT in the ICICI Bank, Sector-34 A, Chandigarh in the account of Punjab State e-Governance Society bearing no. 040301000156 (IFSC code ICIC0000403). The Unique Transaction Receipt (UTR) no. and the scanned copy of the receipt must be uploaded to the online portal before 01.06.2018 by 05.00 PM. 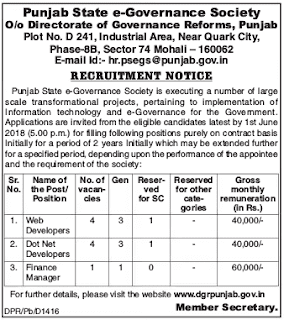 You can apply online for the DGR Punjab Jobs through the official website of the department as per the format available on or before 01.06.2018. Note: For more information kindly read the advertisement notification.